I’ve been a caregiver for almost 6 years now and I’ve functioned that way in several different ways from hospitals to nursing homes, rehab hospitals and finally home. I’ll be the first to admit (as most will) that it’s not an easy job. At times I miss the BC (Before the Crash) life that I had. Being a caregiver offers no breaks, a huge loss of freedom and major changes. It can be so difficult to just keep putting one foot in front of the other. Areas that were not a struggle before, are now front-and-center-in-your-face. One thing that many do not realize about caregiving is that even the bright spots can be overshadowed by the situation. It’s almost like you aren’t allowed to enjoy the pleasures of life like others, or at least not to the same degree of enjoyment. But tonight I had a great bright spot and I held on to it because I didn’t want to miss it. My daughter and the grand-babies were here for the evening. Well, I’ve been trying to get out and walk each evening and my daughter has also started walking for health reasons. Tonight we walked through the park to the splash pad on the other side and let the grands play in the water. It was so much fun watching them run and play and giggle as they got splashed by cool water. We laughed a lot – and that was nice. 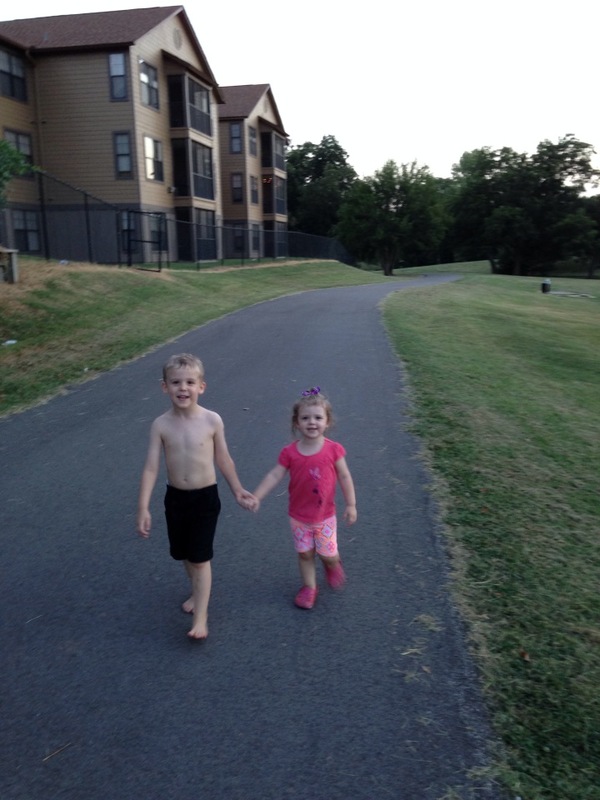 As we began walking back to the apartment my grandson took my granddaughter’s hand. I was trying to capture a picture so my daughter began pushing my son in his wheelchair. That’s not an easy task as he weighs about 150 and the chair another 80. I found myself caught between the two – my daughter in front pushing my son and my two grandchildren behind. I was listening to the children’s chatter and heard things like Eli telling Kyrie that he was the big brother and she had to stay on the pathway because he didn’t want her to fall in the icky water. In that moment I took a mental freeze-frame shot. I wanted to savor it, remember it and let it be pleasurable. It was just a perfect evening and I gave myself permission to enjoy it. As caregivers we can get so caught up in taking care of others that we fail to miss these kinds of bright spots. Our schedules and lives can be so rigid that they shroud the pleasantries. It’s okay to enjoy some things in life; it’s not against the rules. Maybe I’m learning how to live a little bit. It’s certainly not what I had imagined, and it’s definitely not the way I had my latter years planned. But it’s okay to laugh, play and enjoy things. There’s no telling what tomorrow might bring – how well we know that – so when we have these little bright spots — hold on to them — let them be bright, don’t dim them with the gravity of the circumstances. It’s okay to live. So tonight I decided to get my son back outside for a bit. It’s funny how everything can become so terrifying. I used to walk him almost every evening. There is a nice paved walkway in a frisbee golf park behind the house. It’s pretty much a mile from my door, through the park and back so it makes for a nice little walk. Since he got sick back in November I have been so nervous about getting him out but tonight I figured we both needed a little “fresh air therapy.” We’ve been locked up in the house this week. It was really a nice walk, it was still a little warm but there was a nice breeze blowing. I enjoyed the breeze, Chris not so much. Hopefully he will get used to it – we live in Oklahoma so he’s going to have to! We only saw about three people while we were walking. My mind can race and it sure did tonight. I noticed why each person “appeared” to be there. My assumptions of course can be wrong, but hey – it was my imagination. Anyway. One young man was exercising his dog, another lady was pushing a stroller and the other person was walking – my guess is to lose weight – but again it’s only an assumption. The young man passed us twice since it’s an out-and-back route. Both times he spoke in a friendly manner, without actually generating any conversation. The lady with the stroller looked the other way as we passed by while she was sitting on the bench. And the other lady at least nodded in our direction. I started thinking that it seemed we were all in the same place, at the same time but with entirely different agendas. We used the same park, at the same temperature, dealt with the same wind and walked on the same pavement. But all of our motives and purposes were entirely different. I began to feel very disconnected. To them. To others. In life. I realized the park scenario was very parallel to how I feel in general. I’m in this world, walking through life with a lot of people doing the exact same thing – but we are so disconnected. Our worlds do not overlap. I go my way (on the same path) and everyone else does the same. It can be so easy to get caught up in what I have to do that I do not have any regard for anyone else on life’s path. It can be so easy to live for the moment – and live in our own little worlds without thinking about others at all. I did a devotion called “Quietly Discarded” that kind of makes that point and talks about being politely ignored. I guess the lady on the bench got me to thinking about it. But we really get that a lot – people really do not know what to do with us – we don’t look like the typical picture of life and so it’s easier to ignore than to look at the “ugly” parts of life. In many ways I feel like I just don’t belong in life’s picture. I’m here along with everyone else – but my walk is not like anyone else’s. It’s funny because we can all say that really. But I feel the disconnect from “normal.” At first, I feel angry about that. I get mad that I have gotten used to pushing my son everywhere in a wheelchair and learned how to navigate it through tight spots like most stores. You should see me at the grocery store, I’ve done quite well. I can push Chris with one hand and pull a cart with the other. We make a nice little train. But it makes me mad that I have to adjust to that. Tonight I was mad that we were different. I missed my son walking and talking with me. We had coffee together today – he drank a little – I drank a lot. But I remembered sitting on the porch with him literally for hours as we discussed God and church from many angles. We could dissect scripture and talk for hours only to realize we had no real solutions while we went through pots of coffee. I miss that. That’s when I get upset and start a horrible downward emotional spiral. I’m learning to catch myself. Most gladly therefore, I will rather boast about my weakness, so that the power of Christ may dwell in me. It Would Have Terrified me Before! There is a lot going on which means that my mind is working overtime to keep up. Hence, the post midnight blogging. I won’t even try to tell you all that is going on but right now things are in an upswing. Chris is doing well and making slow but steady process once again. It’s almost like he picked up where he left off last year when he started getting sick. It seems to be going much better. When he does better – my whole mindset is better. Trust me – it’s just good when it’s all on the upswing together. Anyway – that kind of catches you up to where we are and I hope to be a little more regular with the blogging because it helps me process my emotions and thoughts – and boy do I have a lot to process! But tonight I had something really crazy happen at the race. It was the Limbs for Life 5K and the proceeds help provide vets with prosthetic limbs. Usually there are runners with prosthetic devices and I really do not feel worthy to run with or for any of these honored individuals. There is a wheelchair division at this particular race too. They kept telling us to stay to the right since it is an out-and-back and the wheelchairs and other runners will be returning and they will need the other side of the track. Somehow a kid got tangled up with a racing wheelchair at about one km in. The wheelchair went flying and the guy in it fell completely out. It’s a good thing he was wearing a helmet. I stood there for a minute to assess the situation. What I witnessed in the next 2 minutes was simply amazing. One lady began directing traffic and making the runners move back to the right so that they could continue moving. The mother of the child and two other people ran to the overturned wheelchair and started checking on the young man. They turned the wheelchair back upright at which time I stepped over to help steady it for them as two people picked the man up and put him back in his chair. He kept saying he was fine and he took off again. I took back off leaving the poor little boy crying in his mother’s arms. I took away a lot from this experience. One was that before Chris’ injury I’d have likely kept running with the other runners because I’d have been terrified to even think about helping. It actually was very natural for me to step over and offer assistance, although I really didn’t do anything much. The second thing was I got mad. I was so angry that the young man in the chair could have been seriously injured because someone didn’t follow the directions. Now I do not know if the child’s mother didn’t try to keep him to the right or what happened as I did not see that part – but I got fighting mad as I thought about how negligence could have really hurt someone and almost 6 years ago my son was injured through a negligent (not purposeful) act. BUT — before we turn our noses up and pass judgment on this kid and his mother – let’s examine ourselves. How often do we go over the speed limit because we know that they won’t stop us up to 5 over – right? It’s no different. The rules and laws in most instances are made to provide protection and our carelessness or need to “get on with our agenda” can cost someone else dearly. Later I did muster up some compassion for the little guy as I know he was really frightened by the ordeal. For my part – I surprised myself. It was so natural to step in – the race did not matter. I had no thoughts about the race until I was sure the young man was up and rolling again. I estimated we were there with him for about 2 minutes. That’s about what my final time reflected – and I still came in third in my age group and came home with a medal! I’ll try to not be so judgmental about the other guy – and concentrate more on my own character. Forgiveness many times, is an everyday thing for me. Gotta keep working on it….